April 1st - June 30th, 2019 RECEIVE A $450.00 MANUFACTURER'S REBATE!!!! We offer Stryker Style Battery Replacements and Repairs. ***EQUIPMENT REPAIRS: Battery-Powered, Electric and Pneumatic Powered Equipment and Accessories. Rigid Endoscopes (Small Diameter Arthroscopes!). Electrosurgical Units. Surgical Instrument Repairs, and MORE! Please remember: WE DO NOT CHARGE A FEE FOR REPAIR EVALUATIONS. We offer: Stryker - MicroAire - Hall - ConMed - Linvatec - 3M - EQUIPMENT REPAIRS. 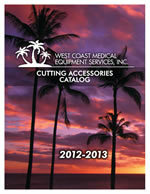 Welcome to West Coast Medical Equipment Services, Inc.
New & Used Medical Equipment, and Repair Services. West Coast Medical Equipment Services is a Smaller Streamlined Company offering personalized boutique service, and better prices than our large company competitors, who have much higher overhead, Salesmen who are hard closers, and automated phone answering systems. Our Goal is to provide the best service you have ever had! West Coast Reps have many Years Individual Experience in New & Used Medical Equipment Sales, Customer Service, and Medical Equipment Repairs. We offer choices for Higher Quality Name Brand Equipment, and a six month warranty on most Used Equipment. We have a Customer Satisfaction Guarantee. Please give us an opportunity for a no-nonsense approach to your Customer Care and Service. Please call us to discuss any items listed. Please call for items you do not see listed, as we may have them, be able to get them, or may refer you where to find them. We strive to deliver the items listed. We are in an ever changing global market place. All Equipment is subject to availability, and market price fluctuation without notice. We may run out of stock on items listed on our website. We do not remove the item as we are working on re-stocking that item. Due to the ever changing economic market and the availability of product, we cannot list prices. We offer many products not listed on our website. Our website is controlled by live Humans, please be patient with your Inquiry, or Quote as we will respond as quickly as possible. Please call during business hours for the fastest service. Our Business Hours: 8:00am to 5:00pm Pacific Standard Time, Monday-Friday. For Prices, or Questions please Call, Email, or submit a Quote, and we will respond to you with Pricing, and Information. Copyright © 2005-2019 West Coast Medical Equipment Services, Inc.